I started this a few months ago utilizing leftover strips from my block building process. I had the columns built and they hung on the wall for a long time. I knew the concept of what I wanted to create. When I saw the the way the rows seems to be tied together with the couched yarn it reminded me of the school yard game. In planning my write up about this piece I decided to go to wikipedia to try to get more info. It seems that after the 70s the game lost its luster, replaced by more updated pursuits and because of its history of being relatively dangerous-- broken arms and "clotheslining" where your neck gets caught in the arms of the receiving team....for those of you who are very young, a clothesline is that outdoor device for drying ones clothes on a wire or cord stretched between 2 poles-- now often against the rules in deed restricted neighborhoods. 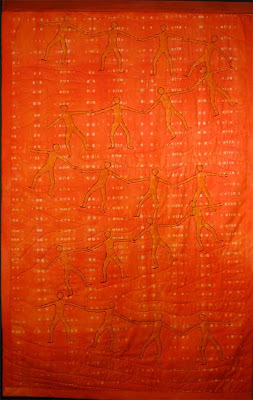 Here's a detail shot showing the couched yarn as well as the outlined figures in the quilting. This is the back. If did the figures on silk organza. I made a stamp from plexiglas plus drawing using my glue gun. Each was cut out and fused to the foundation. Then I freemotion outline stitched from the back using the thicker metallic thread as bobbin work. This is such a happy piece. 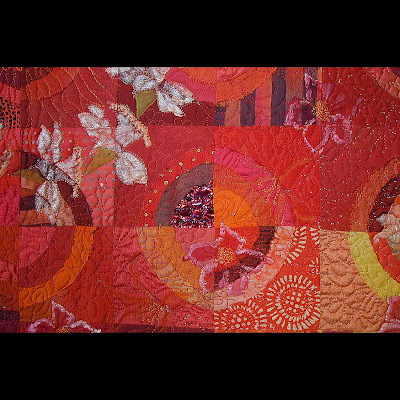 It stayed on the design wall without being quilted for several weeks. 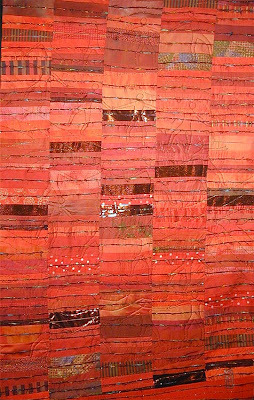 Although I loved the color movement I couldn't seem to resolve the quilting. Then I realised I wanted a fairly realistic depiction of some flowers. I traced some clipart flowers onto tracing paper in a wreath design. Then laid the tracing paper on the quilt top and stitched through the tracing paper to get the detailed outlines. After doing the two inside wreaths I was again stuck and unable to resolve the outer corners nor the in-between sections. So again it hung on the design wall while I finished Sweeping Changes. Finally I had stared at it long enough that it started talking to me again. Another wreath of detailed flowers, this time apple blossoms, daffodils and daylily. Then I wanted to boost the visibility of the flowers I had made so much effort to create. So I got out my paints. 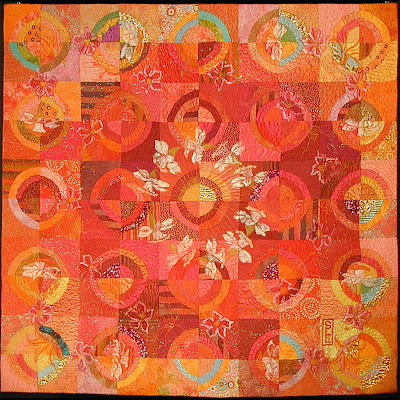 Here you can see the inner circle of daffodils as well as the in-between stitching and the apple blossoms and daylillies of the second wreath. 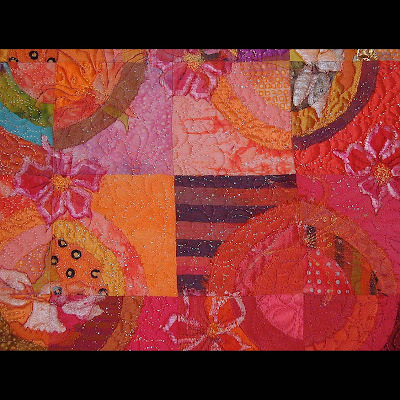 In addition to the flower detail, you can see where I switched to a metallic thread for the in-between quilting. This was a sweet little piece to create. Its size is 35" x 35". I'll have it posted on my website shortly. 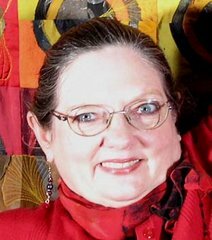 I have entered it in Fiber Focus along with Slipstream Adventure and Freefall. 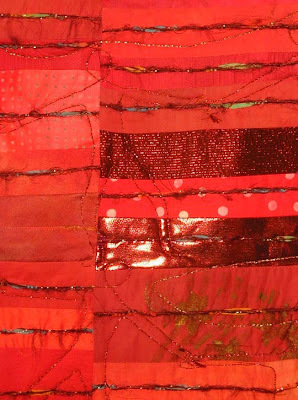 Fiber Focus is a nine state textile exhibition presented by Art St. Louis. The competition is tough. I have only once been able to get my work in.